Last week saw the arrival of an OpenROV (an open source Remotely Operated underwater Vehicle, see for a little bit more background my work blog). An older version is still in the process of being built so the second, newer version, was ordered pre-assembled so we are ready to go. The goal of these machines is to help in community outreach events, to use for student projects (eg surveying local eelgrass beds or quantifying the extent of marine litter), to hopefully do some science with (see here for Chris, the marine biologist in charge) and also to just have a peek at what lives a good deal deeper than we can scuba dive! 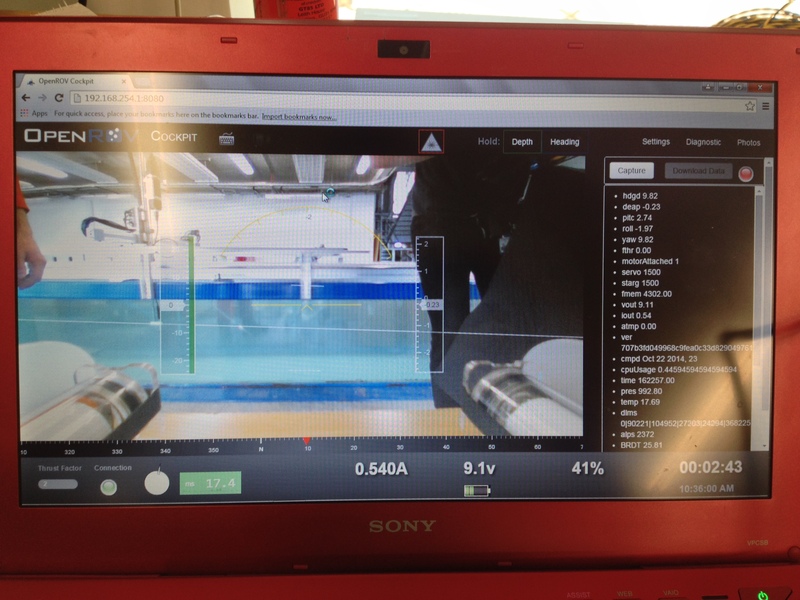 Fortunately, the ROV was easy to set up: load with six batteries and plug in to a laptop running Chrome. This makes the HD webcam come on, and propellors, LEDs and lasers (to measure distance) can be operated using the keyboard (a game controller is on the way). After greasing the O-rings, sealing the main- and battery compartments and tightening some straps we were confident that we could dunk it in the water. Fortunately a large flume tank in use by wave energy engineers can be found on campus: perfect for a first try. Navigation is still a bit tricky. This little clip does not show how fast it can go (pretty fast). The video shows the ROV in action filmed with my iPhone and my GoPro placed underwater (the water is very cloudy because it is seeded by tiny glass beads used to visualize waterflow). We had a quick try in the Fal Estuary afterwards but cut it short because of the bad weather. Use in open water proved a lot more difficult. It was tricky to go under and so we’ll have to adjust buoyancy (i.e. tie-rap more nuts and bolts to it). Also, the ROV was operated from the car (out of the rain) and so there was no direct visual contact making it difficult to find your bearing (of course there won’t be either when the ROV is deployed in deeper water). Hopefully some ‘real’ footage here very soon! This entry was tagged OpenROV. Bookmark the permalink. Absolutley fantastic! That would be a childs dream for me 😉 Cant wait to see footage. Good Luck! Cool – a very futuristic machine. Should try to have a crowd funding to get this machine on a market. Glad you managed to get your OpenROV up and running. I’m thinking about using one for a lionfish survey below 30 meters depth, and I was wondering what your opinion is about using it for this sort of work? I know there are a lot of hobbyists out there, but I’m hoping you might have a feel for it as a scientific instrument. Also, are you using the newer 2.7 version? Cheers and thanks!